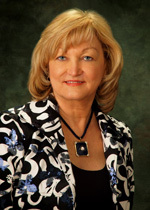 Denell Butler Hahn was born in Tonopah, Nevada and arrived in Henderson in 1945 with her parents, Charles and Katy Lee Butler, and sister, Margaret. A true Nevada native, her grandmother, Florence Butler, moved to Eureka, Nevada in 1884 and the family has lived here ever since. Denell graduated from Basic High School in 1962 and attended University of Nevada Reno and UNLV. She worked for Clark County and retired as Director of the Social Service Department in 1995. At that time, she began Hahn Consulting Services and worked with private clients for the next ten years. Now retired, she and her husband Mike (Basic High School class of 1959) still live in Henderson as do their daughters Valerie, Beverly, and Debbie. Passionate about her city’s past, Denell believes it is essential for the stories of Henderson and the accounts of the early families to be handed down to the next generation.